Seeing those connections -- between a starving orca and dams along the Snake River -- requires education. A grieving orca mother pushing her dead child. Her pod mate slowly starving. 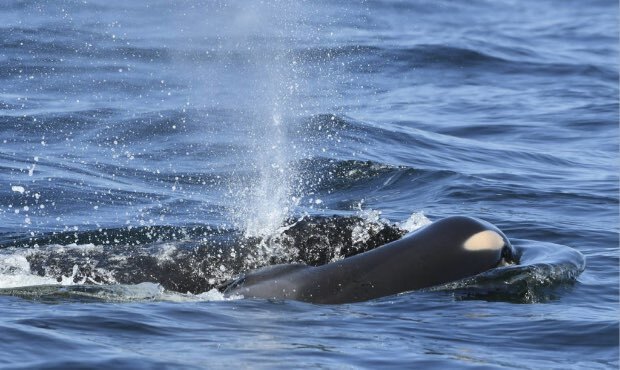 Since July 24, these are the scenes coming from the Puget Sound as Tahlequah, a southern-resident orca whale, has pushed the corpse of her newborn baby. It's continued for weeks attracting world-wide attention as she continues to carry her dead calf. At the same time another member of Tahlequah's pod, J50, appears to be starving, prompting scientists to mount emergency feeding operations and energizing efforts to save the endangered species. Spokane-area activists and environmentalists say the drama highlights the political and biological connections between the Columbia River Basin and the Puget Sound. "It's certainly connected biologically because we (the Spokane River) were once a huge chinook salmon mill for orca and could be a good one again," said Jerry White, the Spokane Riverkeeper. Tahlequah is one of 75 orcas remaining in the Puget Sound, a 30-year-low. The main issue facing the orcas is a lack of food. They eat primarily Chinook salmon although attention has focused on other stressors as well, including pollution, noise and boats. White points to efforts by the Colville Tribes and the Upper Columbia United Tribes efforts to reintroduce salmon into the Columbia River. "They're doing the heavy lifting," White said. "That work will provide huge benefit to creatures like the J-pod who subsist only on salmon." Additionally, White said strict Environmental Protection Agency standards regulating the amount of polychlorinated biphenyls that may be released into the water must be upheld. Mayor David Condon traveled to Washington, D.C. to meet with the EPA last year to argue against the new rules. Congresswoman Cathy McMorris Rodgers proposed reducing the threshold in an appropriations bill amendment at the end of July. Orcas ingest PCBs when they eat salmon. PCBs have been shown to lead to a weakened immune system and hampered reproduction, among other things. "It turns out what's really good for clean water over here is going to be really good for orcas," White said. The amended appropriations bill is currently under debate in the Senate. The Southern Resident Orca Task Force convened Thursday in response to the Puget Sound crisis. Some believe the publicity Tahlequah has received may instigate aggressive action. "I think it's game changing," said Sam Mace, the Inland Northwest Director for Save Our Wild Salmon. "People were there from Ireland and England to testify yesterday. There were 150 members of the public." Mace attended the task force meeting which was held in Wenatchee. The surest way to replenish the chinook salmon runs, according to some scientists and advocates, may be the most difficult: removing the four lower Snake River dams. There is little political will for a move that would anger farmers and business interests. Neither 5th District Republican incumbent McMorris Rodgers or Democratic challenger Lisa Brown support federal legislation calling for removal of the dams. Opponents of removal say the dams provide an irreplaceable power source for the northwest and they argue that improving technology and procedures can insure greater chinook salmon survival. But, Gov. Jay Inslee ordered the task force to consider breaching the dams. "We need to take those dams out," Mace said. "That is the single biggest bang for the buck thing we can do to get them more food." She also emphasized the importance of increasing spills over the dams, which help the fish return to the ocean. "I think people over here need to learn a little bit more about that," Mace said. She added, "The salmon connect us to them."